The Sefer Tluste is a special 290-page memorial volume published in 1965, with contributions in Hebrew and Yiddish from over fifty authors, commemorating the town of their birth. The content describes the rich history and life of Tluste in more tranquil times, as well as the tragic events that led to the extinction of the town’s once vibrant Jewish population. Collectively, the articles make reference to hundreds of historical personalities, as well as Shoah survivors and victims. The volume includes copies of numerous photographs that appear nowhere else; indeed, with the passage of time, many of the originals have probably been lost forever. 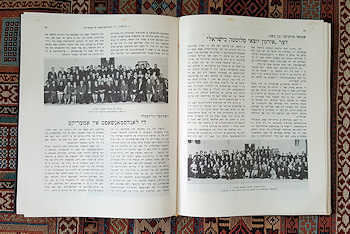 As such, the Sefer Tluste is a tremendously valuable resource for learning about the town’s distant and more recent past, until the end of the Second World War. That said, it is important to appreciate that the contributors to the Sefer Tluste represent only a small fraction of the Holocaust survivors known to have been associated with the town and surrounding areas during the period of Nazi occupation (1941-1944). While the volume gives an impressive overview of what transpired, from their perspectives, their account is by no means comprehensive. For instance, the Sefer Tluste offers little detail – with some exceptions – about the individual perpetrators of these odious crimes against humanity; nor does it offer much information about the many individuals who risked their own lives to help Jews survive their harrowing ordeals. More comprehensive information on these topics can be gleaned from written testimony provided to war crimes trials conducted in Germany from the late 1950s to early 1970s; from hundreds of other written and oral testimonials produced mainly between the 1940s and 1990s; as well as from documentation submitted to Yad Vashem in support of nominations for “Righteous among the Nations”. It must also be acknowledged that the individual contributions to the Sefer Tluste, important as they may be, are reflections of each contributor’s personal perception of reality, to the extent that their memory allowed them to recall certain events (in some cases, two decades after the fact). Only by comparing many testimonials can one begin to appreciate where certain factual inaccuracies and other discrepancies lie, which shall nonetheless remain a part of the official Sefer Tluste record. Perhaps the greatest limitation of the Sefer Tluste, for over a half-century, was that the content was largely inaccessible to non-Hebrew/Yiddish readers. In 2006, I gave a presentation about Tluste to a small gathering at the annual IAJGS International Conference on Jewish Genealogy, held that year in New York. There, I made a remark to the effect that: Wouldn’t it be wonderful if these important testimonials could be translated into English, to make them more widely accessible. To her great credit, Sara Mages took up the challenge and voluntarily began to translate the Hebrew texts into English. As I was already familiar with so many of the names of people and places mentioned in the Sefer Tluste, I offered my services as a proof-reader and editor of the English texts. With the approval of the Young Tluster Society, arranged by Renee Steinig, the completed translations were gradually posted online to the website of JewishGen (details below) as part of the major “Yizkor Book” project managed by Lance Ackerfeld. This rather time-consuming exercise continued on-and-off for over a decade, until I thought we had reached the end of the road, towards the end of 2017, with the completion of the final Hebrew-English translations. Just then, Lance suggested: How about the Yiddish translations; and what about the several poems of Shimshon Meltzer (which had not yet been translated)? This extra undertaking – made by Yael Chaver and Dave Horowitz-Larochette – proved to be very worthwhile, as the additional translations greatly enrich the volume.